Yes, Virginia. There IS a Walking Dead sim in SL. The latest re-creation of The Walking Dead features bits and pieces from each season of the show. The Walking Dead sim at Village of Pandora uses the Grim Combat System. UPDATE (June 3, 2015): No Virginia, it's gone! Oops! I visited recently and the whole region is transformed into a totally different and NON-Zombie theme. That didn't last long. Thanks SL Go. You were fantastic! 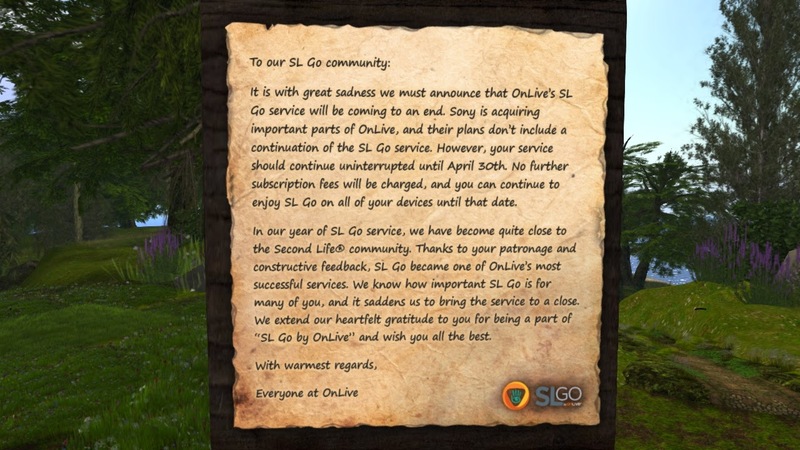 Many thanks to OnLive and the kind folks at SL Go who were very generous with their time. You set a great standard in exceptional customer service. I'm still reeling from the news about the near end of SL Go. The service lasts until April 30, 2015 and then it ends. When the last of my high-graphic SLGo photos are posted here, my blog will end activity. It will remain dormant until I can afford an upgrade. In the meantime, I'll be here and there in SL and on Twitter.